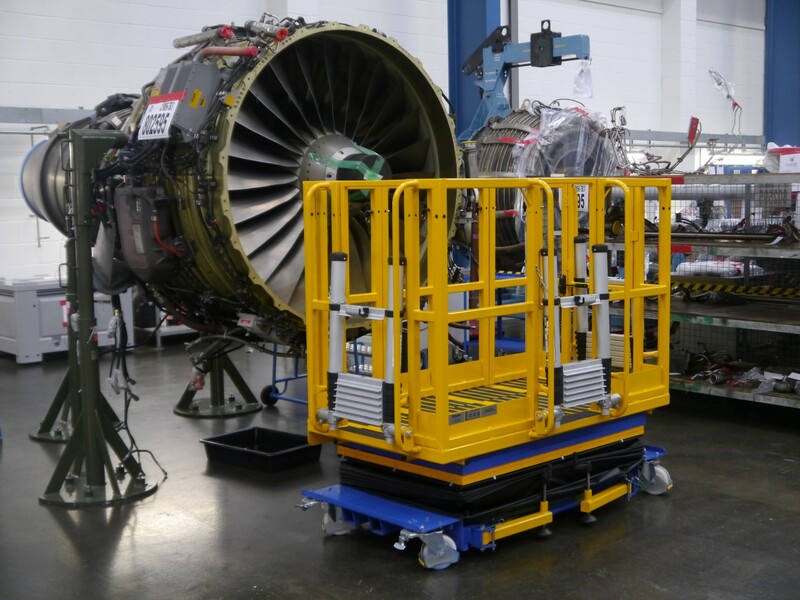 The Multifunctional Working Platform has been designed for a major international engine build client within the aerospace sector. The solution allows access to the upper casing of turbine engines when providing ongoing flight-line engine maintenance. Manufacture to drawing number: AD-693-2015-04. Platform height adjustment range: 600mm to 1800mm. 1500 x 1000mm platform floor size. Safe working load tested to 300kg. Movable railings to enable access to whichever side required. Harness fitting points on platform. Geared handle to raise and lower platform with ease, including locking gearbox to prevent movement during use. 4 x 75mm swivel braked castors that can also raise platform from the floor. Aluminium adjustable height ladder that can be folded away when not required. Extending cantilever section of platform with drop in floor panel for extra access. This feature has been changed to allow additional sections to slide out. Outrigger legs to be utilised when platform at full extension.